MILWAUKEE, Wisc. 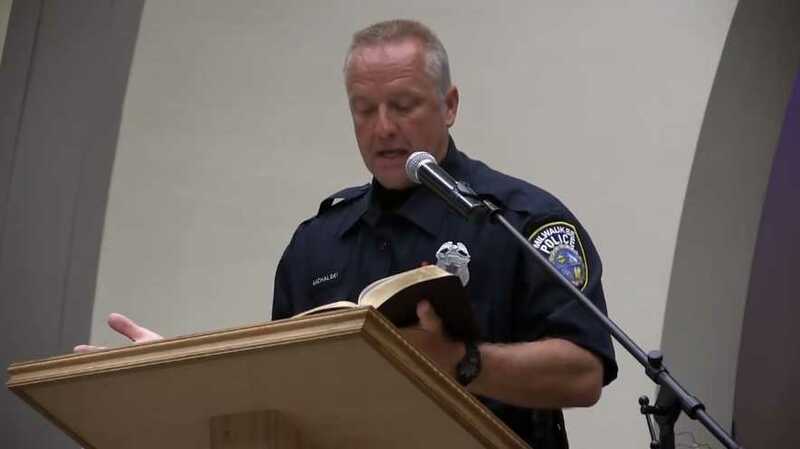 — A Wisconsin police officer who was killed in the line of duty this week was a Christian who would share the gospel with those he arrested and pray for their salvation. Michael Michalski, 52, of the Milwaukee Police Department was killed on Wednesday while among a group of officers with the Special Investigations Division pursuing Jonathan Copeland Jr., 30, a convicted felon who was wanted on drug, domestic violence and parole violations. Copeland had been seen running into a house, and officers followed. However, upon entry, Copeland shot at the officers, striking Michalski. The other officers returned fire. Michalski was transported to the hospital, where he died of his injuries. Copeland surrendered only after running out of ammunition and was not injured. A sorrowful Chief Alfonso Morales spoke to the media on Thursday, outlining the details of what happened to Michalski, who he spoke of as being an ideal policeman. “He is the person who you would want to cut out and cookie-cut and say, ‘This is what we want the Milwaukee Police Department to represent,'” he said. “He’s a Christian; well-loved on the department,” Morales also noted. Michalski’s pastor, Ross Layne of Grace Community Church in West Allis, likewise told local television station Fox 6 News that Michalski was a man whose heart had been changed by the power of God. In 2016, Michalski shared his testimony at Desatar Ministry in Milwaukee during a special service honoring the local police force. During his talk, he explained how God had opened his eyes to his sins and his need for salvation. Michalski shared that three years prior, he received a phone call from a female acquaintance that he had not heard from in 20 years, who wanted to ask if he had a certain phone number. During the call, the two also talked about the death of the woman’s nephew, and she wondered aloud if he had been told about the Lord and if he was in Heaven. Michalski said that the discussion caused him to think about all the times someone had ever mentioned God to him, both good and bad, as well as how he had treated God through the years. “[T]houghts came through my head of all the times I cursed God, all the times I mocked God, all the times I shook my fist at God, all the times I didn’t believe in God,” he explained. The next day, Michalski had to report for an incident where a young man was being kicked off a bus for reading the Bible. The man gave Michalski a gospel tract, who placed it in the visor of his car. He soon began to ponder the reality that he had never told his wife and son about the Lord, and realized he would have to answer for that. He said that he had struggled with hatred for drug dealers, gang members and prostitutes because of how bad they were, but the Lord brought him to realize that the field was level. He said that he began to realize that all the crimes people commit stem from a sin problem, which motivated him to talk to those he arrested about the Lord and give them a gospel tract. “Some people have cried. Some people have broken down. Some people have said, ‘No one has ever spoken the word of God to me before in [my] life,'” Michalski recounted. And where there once was hate, he now felt a genuine care and concern for the souls of men. Michalski also lamented the rise of crime in the country, but said it all points to what was promised in the Scriptures. The funeral for Michalski will be held at Oak Creek Assembly of God on Aug. 1 at 3 p.m.
View Michalski’s testimony below at approximately 52:00 into the service.